Home / Featured, Home Brewing / Did You Get Homebrewing Equipment For Christmas? Did You Get Homebrewing Equipment For Christmas? Did you get homebrewing equipment for Christmas and need a little bit of guidance so that you don’t make undrinkable beer? Or are you already brewing and want to learn more so that you can make better beer? 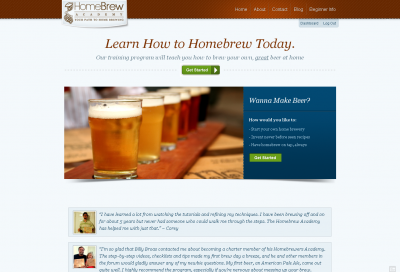 I just joined the Homebrew Academy run by my friend and fellow beer blogger Billy Broas. It’s full of great information for people just getting into homebrewing, as well as more advanced levels of homebrewing knowledge for people like me who want to keep learning. I’ve checked out a lot of the other homebrew education sites and ebooks for sale online, but this is the only one I would recommend. I’m already digging into the videos today, but next week I’ll give you a preview of the Homebrew Academy and a little bit after that a full review of the online eCourse. Join me over at the Homebrew Academy today.